In my days at the Delhi University I had a large number of friends from the North East. A common taste in Heavy Metal music was the main reason for the same. And ofcourse I used to love the stories told about the North East by these guys. We also had another commonality that we came from lands from where Insurgency was rife and only someone who has grown up in an Insurgency can really understand how it feels. And of course last but not the least was our common love for the Mountains / Hills. And from my friends amongst the Nagas, I had Angami, Ao, Konyak and Tangkhul and from Manipur I had Meties and the Kukis. This interrelation of the tribes was another thing fascinated me as well. An often our conversation would drift to the our respective worlds where I would speak of Kashmir and they would speak of the fascinating North East. I still remember I almost broke up with a Naga girlfriend who told me that Dzukou Valley was more beautiful than Kashmir. Of course I couldn't take it lying down. I asked her if it Snowed there ? She said yes it does Snow there. I said it doesn't Snow in Nagaland. She said I didn't know anything. And of course then the argument went overboard to the point that we didn't speak for many days. Not that it mattered but since that day the name Dzukou Valley was stuck in my mind and will surely visit one day as now I have seen many pics of this beautiful place. Anyways coming to the point. While discussing the Insurgency and the various Insurgents Groups the most dangerous place which was always mentioned was the border town of Moreh in Manipur right on the border with Burma as it used to be. I heard tales of strong Insurgent-Smuggler-Drug Runners mafia which ran things over there and apparently the area was such that even the Security forces would stick to the regular areas. And of course there were deadly rivalries between the different Insurgent Groups due to their different Tribal loyalties. But the strangest fact was that most of the border trade was controlled by not someone from North East but originally from South India. It was controlled by the Tamils who had settled here. And these were Burmese Tamils. Of course I used to ask how come the Tamils ? And that too Burmese Tamils ? Did something called a Burmese Tamil even exist ? And how do they manage as “outsiders” in what was considered an environment very hostile to the outsiders. I could never get a satisfactory answer for the same and over a period of time I also lost interest in this particular subject. But lately as I get more into Research and History I tried to actually find out the History behind the Tamils of Moreh and how they came to settle in these lands far removed from their ancestral Tamil lands down South. And settle in lands which were considered too hostile for any outsider to even come for a visit. So this is what I found out. In Burma Indians from various parts of India have come over the centuries for various trades and practices. Among them were Tamils many of whom were Chettiars who were into Money lending and trading. And over a period of time many Tamils came and settled here like they did in other places like British Malaya and Singapore. However in the 1930s started a wave of Nationalism initially targeted at the British but which soon turned into a agitation against all perceived outsiders and as a result many Indian started to leave Burma and go elsewhere. After the Burmese secured Independence the problem just got exaggerated as the Burmese Government refused to recognise the Indians living there since Generations as citizens. So another mass exodus started and this included a large number of Tamils who returned to Tamil Nadu. Once back in Tamil Nadu many got used to life in their new Homeland but many were not at ease with the move and found life difficult. They decided that life in Burma was still better than life in Tamil Nadu and they decided to go back to Burma. Since going by Ship would entail many problems with documentation and such so they decided to try the overland Route via the North East. Many of you must be aware that the Indo Burmese border is quite a porous Border unlike our Borders with other countries and its relatively easy to cross it. So all the Tamils who wanted to go back to Burma landed up in Moreh which was the last Border town in Manipur before Burma. But once again the Burmese refused to admit them and recognise them as Burmese nationals. The returning Tamils were however in no mood to go back to Tamil Nadu and decided to stay put in Moreh and keep trying their luck with the Burmese and maybe they liked the environs of Moreh. And I assume most of these Tamils could speak Burmese so they could live by the Border and take part in the trade from Burma. So they stayed put and became an important part of the trading community in the Border town and they relatively large numbers and nowhere to go status gave them some resilience against the Underground Outfits active in the Region. And hence they became a part of the border town of Moreh. Along with some Punjabi and Marwari businessmen who had also settled here in the past. As of today the Tamil community is a vibrant one in Moreh with numbers in excess of 3000 and they have their own Temples and Schools in Moreh. They are still a very important part of the cross Border trade and continue to control most of it. And especially since the opening of official Border trade from Moreh, with Moreh recognised as an important Border trading town, in August 2018. 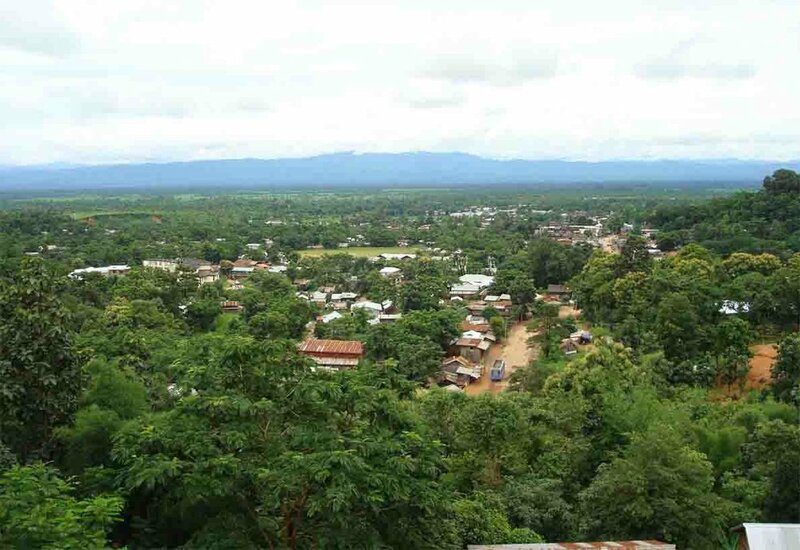 The Town has itself has seen a power struggle between the Kuki and the Nagas over the “control” of the Town and as of now the Town is Kuki dominated. All throughout this struggle which at time included Members of various armed Underground Outfits the Tamils managed to somehow stay clear and still be dominant in the business in this Town but many of them still left the Town. The local Vayapar Mandal or Traders Association is made up almost exclusively of Tamils and the head of the Tamils is often referred to as the “King of Moreh”.